The loft conversion process can be covered in a dozen steps. Here we outline each of the 12 stages of work during the loft conversion process. 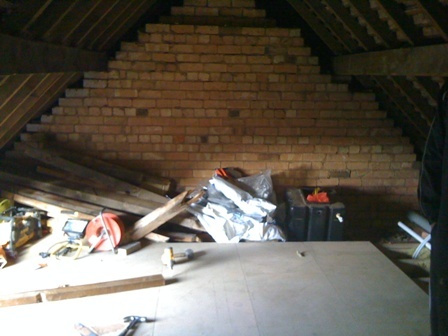 Stage 1: Workers will arrive to put up scaffolding a day or two before the work on your loft conversion commences. Stage 2: The work team arrives to receive the delivery of building materials. Stage 3: Work begins on the floor construction. Stage 4: The floor is completed and the home owner will be asked to survey the work and decide if there are any last-minute layout changes he would like to make. Stage 5: At this stage our company will alter your stairs while we get on with the internal construction such as fitting Velux Windows or weather proofing your dormer. Stage 6: Work on insulation begins along with fitting electrical sockets. The homeowner will be consulted on the placement of lights and sockets. Stage 7: A shaft is, for the stairs which will be fitted when they arrive the following day. Stage 8: Insulation work is finished and the building inspector will arrive to make sure all regulations have been followed. Stage 9: Fitting of plaster boards – at this stage the work of the loft team is completed. Stage 10: The plasterers will take over and spend around 2 to 4 days plastering. Stage 11: The electrician arrives to complete the work on the sockets and light switches. He is followed by a carpenter and plumber who finished work on the extension. Stage 12: The loft conversion Birmingham building inspector returns to pass final completion inspection.